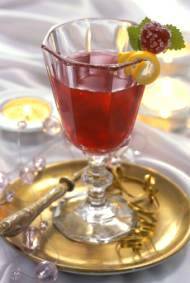 Serve this wonderful punch for New Year's Eve or for a special festive occasion. Double or triple the ingredients if you're serving more guests. Combine champagne, pomegranate juice, seltzer (or club soda) and vodka in a large bowl or pitcher. Spoon 1/2 cup frozen cranberries over punch. Ladle approximately 3/4 cup punch into fancy mugs or champagne glasses over ice and garnish each mug or glass rim with a mint sprig and a twist of lemon or orange peel. Makes 4 1/2 cups, or 6 (3/4 cup) servings.